Since 1969 Aztec Container has specialized in twenty foot long pre fabricated shipping and storage container offices for job sites and construction sites. 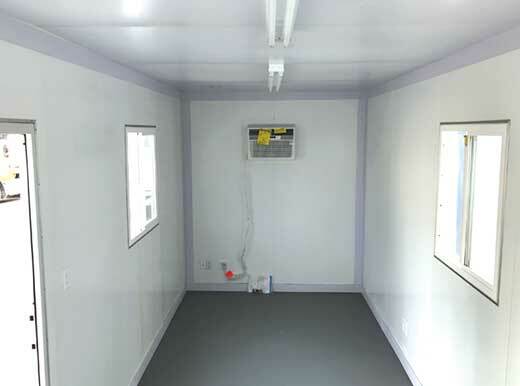 Our 20 ft. pre fabricated office containers are designed to fit your needs. Exterior walls: Galvanized Sheet Metal, with a ¼” PVC Overlay. Interior walls: Aluminum Plastic Composite Panel, with a 1/8” PVC Overlay. (R13) Insulation in Walls, (R19) in Ceiling & Floor. Flooring: Marine Plywood with a (Gray) Epoxy Top Coating. Windows: (2) 3’ x 3’ Double Pane Sliding Glass Windows. Door: (1) 36” Steel Office Door with Lock & Deadbolt + Automatic Door Closer. Electrical Package: (2) 4ft Lights Fixtures, (1) Exterior Light, (4) 110volt Four Plex Outlets, (1) Exterior GFI Duplex Outlet, Phone & Data Jacks, 70amp Breaker Box. 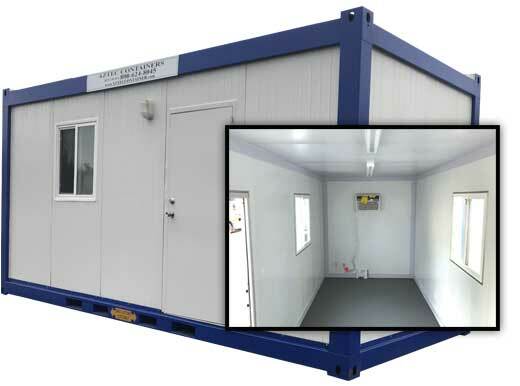 Our pre fabricated office containers are made from the same heavy duty steel frame found in our storage containers. 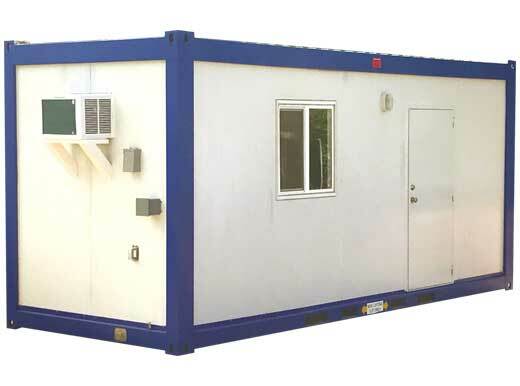 These mobile office containers are designed for portable office use or as a construction office but may be moved from site to site and offer a secure portable onsite setup at remote locations. No matter what style of pre fabricated container you need, Aztec Container can help find a solution to meet your needs and budget! Call us at 1-800-399-2126 for a quick quote or fill out our quick quote form. We offer these for sale and for rent in selected areas. You can read testimonials from many of our satisfied customers below.